Keep your cans organized and accessible with this convenient Lakeside 338 aluminum mobile can rack! With its strong and sturdy aluminum construction, this gravity fed rack increases efficiency for everyday use and provides a "first in first out" system for managing inventory. It holds up to (72) #10 cans or (96) #5 cans for maximum use. Its polyethylene top surface provides additional kitchen workspace and is removable. 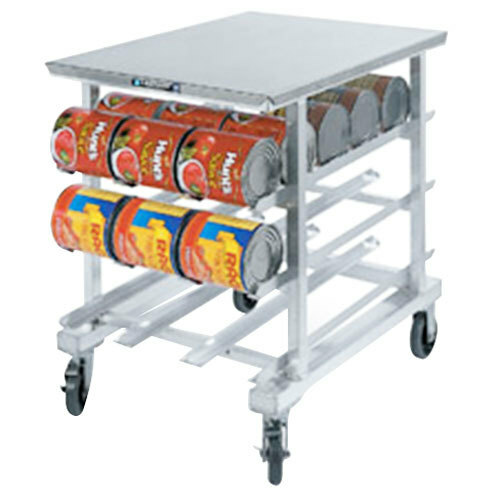 Great for your busy commercial kitchen, this FIFO can dispensing rack will make it easy to store, access, and even transport a large number of cans! The mobile design makes it easier to maneuver the rack through prep areas and clean floors. This unit features (2) 5" swivel casters and (2) 5" fixed casters.